Not slowing down since becoming Donald Trump’s original Apprentice, Bill can be seen on the A&E channel series “We Mean Business” Saturday mornings at 10 a.m. EST/PST. In addition to regularly appearing in The Board Room on the popular NBC prime time show “The Apprentice”, Bill has been a premier guest on NBC’s Today Show, The Tonight Show with Jay Leno, CNBC and quoted in many major national and daily newspaper outlets. Most recently, Bill completed his second book, titled “Beyond the Lemonade Stand” which was written to help educate and motivate young people around the world about the value of money and how to leverage your skills, talents and abilities at an early age. All proceeds from the sale of this book have gone to charity. “Beyond the Lemonade Stand” is the follow up to the New York Times best-selling book in 2003, titled “You’re Hired: How To Succeed in Business and Life from the Winner of The Apprentice,” which chronicled Bill’s successful life, experience and proven advice. Bill Rancic founded the successful company, Cigars Around the World twelve years ago in a 400 sq. ft. studio apartment. Today, it is a thriving multi-million dollar national operation. The son of educators, he is a true entrepreneur, who originally earned his way through college by starting a boat wash and wax business in the Chicago area. Bill is involved in many charities and is an active board member for the Mercy Home for Boys and Girls. In his spare time, Bill has competed in marathons and triathlons and travels extensively speaking to businesses and universities around the country. Do you want to hire Bill Rancic? Directly request a quote. 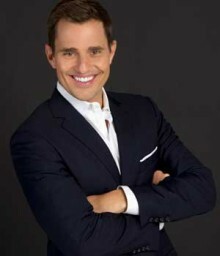 In 48 hours we can send you the availability of Bill Rancic If you would like to book Bill Rancic, Entertainment Booking Agency is the right place. We will offer you the best price and contact the management or we directly contact Bill Rancic. For corporate appearances or speaking engagements you can contact our agents and the will help you true the process. Tags: hire Bill Rancic, Bill Rancic booking, book Bill Rancic, Bill Rancic appearances, find more information on booking Bill Rancic for appearances, Bill Rancic speaking engagements, Bill Rancic endorsements/spokesperson, Bill Rancic appearance fees, Bill Rancic booking agency contact info, biography of Bill Rancic, Contact an artist booking talent agent find a speakers bureau that can book Bill Rancic, speaker booking agency for Bill Rancic, Bill Rancic booking agency, Bill Rancic booking for corporate event. EBA is one of the biggest entertainment booking agencies in the World. We book hundreds of celebrities, artist, athletes and speakers in a year. Important to know is that we are not claiming to be the management of Bill Rancic. We are not the official agent for Bill Rancic. Companies from around the globe book these artists and speakers true our company be course we have one of the biggest networks and we always have direct contact with the artist or the management. We help you to find the right celebrities for your corporate of private events. Please contact one of our agents to get free advice and we will help to get the world-famous artist on your party.